​Although researchers are investigating multiple new strategies to prevent and treat melanoma and other skin cancers, the most effective strategy is to avoid unnecessary exposure to the sun and eliminate recreational tanning altogether. There is no such thing as a good tan; a tan means there is damage. Too much sunlight can lead to melanoma - the most deadly form of skin cancer - but it may lead to other types of skin cancer, too, like basal cell carcinoma or squamous cell carcinoma. Melanoma accounts for only 5 percent of all skin cancer, but 75 percent of all deaths. Basal cell carcinoma is the most common form and is rarely deadly. Squamous cell carcinoma occurs in roughly 16 percent of all cases. While it can often be treated successfully, it, too, can occasionally spread and be fatal. Over the last century, there has been a steady increase in the number of non-melanoma skin cancers. ​Most people are under the mistaken notion that if they go outside in the sun that a plain, white T-shirt will protect them. It won't. A plain white T-shirt is equal to an SPF (sun protection factor) of 2. A wet white T-shirt offers an SPF of 0! 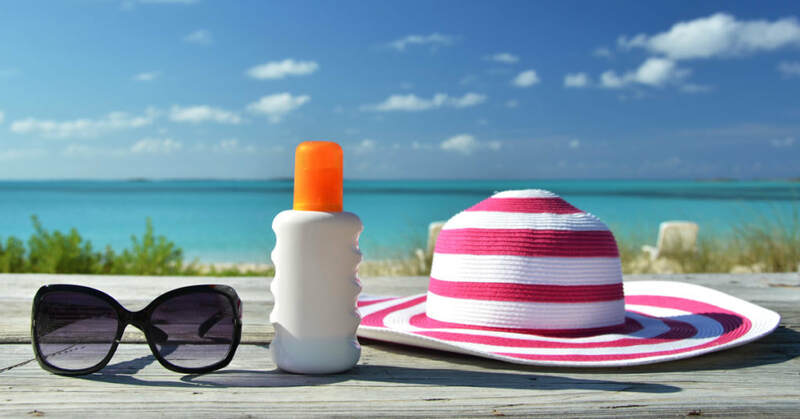 The best thing for people to do is avoid the sun as much as possible, or, if they have to be outside, wear plenty of sunscreen with a high SPF value. Children are especially vulnerable to skin damage, so it is critical that they be adequately protected. Sun protection isn't just for the summer months either. Outdoor activities in the winter such as skiing or sledding also exposes unprotected facial skin to dangerous UV rays. This means that sunscreen use is something that should be done year round. - A is for ASYMMETRY: One-half of the mole or birthmark does not match the other. - B is for BORDER: The edges are irregular or ragged-looking. - C is for COLOR: The color is not the same all over, but may appear patchy, with differing shades of brown, black, red, white or blue. - D is for DIAMETER: The area is larger than about one-fourth inch the size of a pencil eraser - or is growing larger. Jet lag, also known as "time zone change syndrome", is a common problem associated with airline travel across multiple time zones. The majority of individuals traveling across 5 or more time zones will experience jet lag to some degree. Jet lag is the result of a rather sudden mismatch between the body's own internal clock (circadian rhythms) and that of the environment around us. The body's circadian rhythms usually cycle over a 24 to 25 hour time period and tell us when it is time to go to sleep and when to awaken. These rhythms are reset daily to match a 24 hour day by factors such as exposure to daylight and social cues, for example when meals are eaten. However, when traveling across multiple time zones by air flight, these influences now occur at times different from what the body is expecting, and this mismatch can result in a number of symptoms. Common symptoms include poor sleep, daytime tiredness, difficulty concentrating, and sometimes nausea. Most individuals can adapt to a new time zone within 2-3 days, however, depending upon the individual and the number of time zones crossed, symptoms can linger for 5-7 days in some cases. Traveling eastward, as opposed to westward, is a more difficult adjustment for the body. This is because it is easier to lengthen internal rhythms to a day longer than 24 hours than it is to shorten them to a day less than 24 hours. Numerous approaches have been tried to treat jet lag with varying degrees of success. In the few days before traveling, trying to change your body's internal rhythm to more closely match that of the time zone you will be traveling to may be useful. This can be accomplished by altering bedtime and rising time 3 days before travel. Also, trying to time meals to match meal times of your destination may help. Morning exercise can be beneficial as well. During the flight, staying well-hydrated and avoiding alcohol will minimize some of the symptoms. Then, upon arrival at the destination, minimizing napping on the first day and obtaining appropriately timed bright light exposure (sunlight is best) will help. If traveling eastward, then early day light exposure is best. If traveling westward, exposure to sunlight late in the day will help to lengthen your internal clock to match that of the new time zone. Eating meals at the appropriate times in the new time zone is also a good idea. These simple techniques can help adjust your internal clock more quickly to the new time zone. Medications to ease the symptoms of jet lag have been recommended in some cases. Melatonin, a hormone made by our brain in response to darkness, helps bring on sleep. It is the best studied medication for the treatment of jet lag. Taking 5 mg in the late afternoon, usually starting the day before or the day of travel, and then continuing it for a few days after arrival, seems to help reduce the symptoms associated with jet lag when traveling eastward. This drug is available as an over the counter dietary supplement and therefore is not well-regulated. If considering melatonin, the consumer should look for a reliable source from which to purchase it. Other medications that have been tried in jet lag include sedatives (benzodiazepines such as triazolam, nonbenzodiazepines such as zolpidem or zopiclone), to help one sleep, and stimulants, to help one stay awake. There is limited information on the use of these agents in jet lag. Some of the sedatives may be helpful with improving sleep quality, but many individuals experience side-effects, such as confusion, morning sleepiness, or nausea, that limit their use. Likewise, stimulants such as caffeine or prescription drugs, may be helpful in keeping one awake in the new time zone, but have side effects such as insomnia and sleep disruption that can worsen the situation. Health - by choice. Now that's an interesting thought! Many of us think of health as something that happens to us rather than something over which we have any control. The fact is that many of the world’s deadliest diseases are largely preventable - diseases like heart disease, cancer, diabetes, childhood asthma, and obesity. These and other chronic conditions now account for 70 percent of all deaths in the industrialized world. Yet these diseases must have causes. What are the "causes of the causes"? If we look at the actual causes of death, we see that these are lifestyle and behavioral factors - things over which we do have some control - things like smoking, eating a poor diet, and lack of exercise, all of which contribute to the leading causes of death including heart disease, cancer, and stroke. Although you can't do anything about your genetic makeup, gender, race, or age, the evidence indicates that adopting healthy behaviors such as eating nutritious foods, being physically active, and avoiding tobacco can help lower your risk of suffering the devastating effects of the leading causes of death. Leading Health IndicatorsAs part of the Healthy People 2010 project, 10 important health issues in the USA have been identified as Leading Health Indicators. These indicators are intended to help you understand the changes you can make to improve your own health as well as the health of your family and community. Be a Healthier Person: Make Healthy Choices! The following tips will help you make better choices about preventive care and a healthy lifestyle. Take every opportunity to improve your health! By making healthy choices across your lifetime, you can improve the quality and length of your life. Health - make it your choice! Walking is the perfect exercise. Walking is the easiest and quickest way to achieve physical fitness. Walking not only firms up muscle, but also burns off calories. No matter what the pace—from a slow stroll to a brisk arm-swinging stride, you can reap the benefits of a regular walking program. When you walk, every part of your body is used, from your eyes to your toes. Walking produces beneficial changes in the functioning of the internal organs-especially the heart, lungs and circulatory system. The heartbeat becomes stronger and steadier, breathing becomes deeper and circulation improves. No matter at what pace, walking burns off calories. Of course, the faster you walk, the more calories you will use up. However, if you can't or don't want to walk fast, walk longer. For example, if you walk at a pace of 6 km/hour in 15 minutes and cover one and a half kilometer, you will use 110 calories. At a pace of 4.5 km/h for 2 kilometers, you will also burn off 110 calories. If you have been doing nothing more than moving around the house, walking is the perfect exercise to begin a new fitness program. Start with the equivalent of one block on level ground. As soon as you are comfortable walking one block, increase your distance until you are able to cover five to six kilometers in about an hour. One of the most ideal places to find an easy level area to walk is at a shopping mall. Many malls encourage walkers to use their space before shopping hours. - Swing your arms easily in opposition to your legs. That is, when the left leg is forward, the right arm should be forward and vice-versa. The trunk of your body will float along easily. The body should move as little as possible in a good walk. - Strive for correct body alignment by keeping your feet forward and parallel, with arches lifted and balanced. Keep your abdomen flat and your hips tucked under. Your head should be erect and your chin level. - Prepare for an easy transfer of weight by swinging your legs forward with the action initiated at the hip joint. Let your legs push. - Take equal and comfortable steps. If possible, lengthen your stride. - Keep your head and chin up, look proud and make your walk easy. Keep in mind, it is never too late to become physically fit. Walking is the perfect way to begin. The end results are limitless. Aging is a state of mind, body, and spirit that does not always keep pace with chronological age. Aging, or the experience of growing older, is a universal experience that begins when you are born and is completed at death. Aging is a state of mind, body, and spirit that does not always keep pace with chronological age. Your attitude and how well you face the normal changes, challenges and opportunities that arise in life is the best indicator of age. All of the changes that take place will not be positive. However, if you are prepared to meet these changes, you will increase your chances of aging well. Accept the process of aging. Make the most out of what life has to offer. Accept the fact that you will age and embrace the sense of freedom and comfort that everyone should feel in later years. Be aware of the normal changes associated with age. In order to distinguish between normal changes and disease, have regular check-ups. Your physical and mental health are your most important possessions. Do not dwell on aches and pains. A sensible diet is the cornerstone of prevention and an important means of maintaining good health in later years. Avoid overeating. Limit saturated fats to less than 10 percent of total calories. Include plenty of fluids, fiber, vitamins and minerals in your daily diet. Barring any health reasons, include exercise in your daily activities. Be sure to consult your healthcare provider before beginning any new exercise program. Join an exercise class designed for your age. Or, "walk for the health of it." Walking, no matter the pace, is one of the best ways to achieve physical fitness and burn off excess calories. When you walk, every part of your body is used, from your head to your toes. Walking results in healthier hearts and lungs. Learn to Use Your Resources. Use your resources to cope with the changes and losses experienced with age. Those who learn to handle grief, loss, and so forth, can escape the depression that often leads to an inability to cope with losses. Explore new ways to do things. Discover new experiences, new sights, sounds and scenes. Take time to smell the roses. Develop interests, such as hobbies and crafts, and get involved with groups with shared interests. Seek rewarding projects, both with a group and alone. Improve your present friendships and family ties. Make new friends, and don't limit yourself to your own age group. Being with young people can help you feel young. Too many women get all dressed up for work and their hair ruins their image. If you are having a bad hair day, it can ruin your day, too. Take any measures necessary to get, keep and maintain a hairstyle that works for you, not against you. Dirty or uncombed hair is not appropriate in any business situation – wind-blown, messy on-purpose looks are different than uncombed hair. How? One looks uncared for, the other should look stylish. If you are wearing your hair like you did when you were in high school or in college, the style is more than likely no longer as enhancing and contemporary as it could be. Hair that has no movement (sprayed until frozen) is not smart. Find a hair stylist who will help you choose the hairstyle that works for you. A great haircut is only as good as you can make it look on a daily basis – get one that you can manage. Find someone who can cut well – consistently. A good haircut may cost as little as $15 – a good hairstyle may (but not necessarily) cost more, but once you have your hair styled, you can have it maintained by anyone who cuts you well. Show it to the person who will be maintaining your hair within the first week or two when it was styled. “Spiked” or highly gelled hair is fine if it looks normal, or is expected in your business environment. And the last, but not the least: make sure you use salon hair products of good quality to take care of your hair. Damaged or thin hair might benefit from good haircare products especially during summer time. Check out professional hair products for female hair loss, if you are facing this problem. Remember, your hair is part of your image. So choose the hairstyle that really works for you! The health benefits of fish oil supplements are related to the omega-3 fatty acids which it contains. Research by doctors and scientists has shown that many health conditions may be relieved or improved by fish oil. And nowadays there is even talk about a fish oil acne improvement connection and if there's also a link between fish oil and weight loss. Unfortunately, there is no conclusive evidence at all that fish oil can help acne. What little research there is on a fish oil acne connection does not suggest that fish oil supplementation will clear up your skin. However, this does not mean that fish oil doesn't help with acne....only that no hard scientific evidence has been found. So why then is there talk about fish oil helping acne? The reason is probably twofold: fish oil as an acne treatment may have to do with the suggestion by naturopathic practitioners that acne may be a result of a fatty acid deficiency; secondly, fish oil is an anti-inflammatory, and acne is often caused by inflammation -- or, at least made worse by it. In short, a pimple is a red, inflammed area invaded by bacteria. The theory is that fish oil may help quell the inflammation and reduce pimple breakouts or their severity. Even though the scientific evidence is so far scarce, we do know for certain that the vast majority of people can benefit in many ways by using a purified fish oil supplement. So, if you are suffering from acne, don't discount the benefits of fish oil just because there may be no hard proof it helps with breakouts. The relationship between supplementation of fish oil and weight loss is a little harder to explain. Again, there seems to be little conclusive evidence that there is a fish oil and weight loss connection. Fish oils may improve energy levels and overall health of the heart and the brain and is recommended by nutritionists for these reason. Questions relating to dietary supplementation of fish oil and weight loss probably arise from the recommendation of fish oil supplementation by several famous "diet doctors". The bottomline is that neither for acne nor for weight loss has fish oil been proven. But there are thousands of studies which show it is vital for the healthy functioning of many things in the body. Not only is it good for the heart and brain development, but it may boost one's mood and lift mild depression. We also know that the majority of people in the Western world are deficient in Omega 3 fatty acids and therefore most people will benefit from using a high quality, purified fish oil supplement. As early as ancient Egyptian Civilizations bathing has been an essential element of one’s health, appearance, and peace of mind. Bathing is one of the most accessible, exotic and rewarding beauty rituals that you can perform. Showering will get you clean, but fully immersing your body in water is true bathing. For me it is a perfect end or beginning of my day. After a bath filled with lavender and chamomile I feel beautiful, healthy and renewed. Loving and caring for the body is an obligation and bathing was one of the first ways people began to respond to caring for the body. To get the most from your bath time, first of all, prepare your bathroom. Your bathroom should be clean, fresh, and soothing. Lighting a candle or incense and playing some soft music may help to set the mood. Make sure your slippers, towels, and robe are close by. Next, prepare your tub. Draw water that is very warm but not hot. Water that is too hot will actually do harm to the skin. Add natural ingredients to your water such as pure essential oils, salts, herbs, and plant oils like jojoba, avocado, almond, and apricot. It is important that you use live natural ingredients as they help to keep your skin healthy and alive. Natural soaps, herbs, sea salts, and clays are also helpful. Bathing is a healing activity, so you especially want to avoid synthetic fragrances, harsh soaps and other bath additives that will strip moisture from your skin and create a toxic bath. Once you have prepared your bath, dry brush your skin to help get rid of dead skin cells, and to open the skin so that it can absorb the water, and additives in your bath. Soak for 20-30 minutes, taking deep breaths, which help rid your lungs of toxins. Relax and appreciate the water, and the benefits of the natural ingredients in your bath. and then use a natural sponge or cotton washcloth to clean your skin. Massage your skin in a circular motion. You should also use a foot file to remove old skin from your heels. Pat your skin dry, and, starting at your feet, apply moisturizer while your skin is still damp. One of the best moisturizers is raw, unrefined shea butter. When applied to the skin, it’s rich fatty acid and vitamin a content will help to seal moisture into your skin. This step will help to prevent dryness and cracking and helps to keep your skin from aging. Your mind, body, and spirit all gain strength from bathing. Rediscover the art of bathing. ​Your alarm clock sounds, and you’re up like a flash. You get yourself going and then systematically ready everyone else in your family. After breakfast, you’re constantly on the move: working, cleaning, chasing, driving, cooking, bath-time, bedtime …go, go, go until finally, your head hits the pillow. After running your palace, your body is completely exhausted, yet there you lie. Mind spinning and swirling, trying to plan out tomorrow’s agenda. Does this sound familiar? Do you need some help relaxing and getting some well-deserved, or in my case, super-needed, beauty sleep? Give aromatherapy a try. What could be easier than putting a diffuser with a carefully chosen, relaxing scent beside your bed and taking some deep, soothing breaths of aromatic splendor? Lavender. Lavender is popular in perfumes and relaxation products for both children and adults. Why? Because it has such a calming effect on the nervous system and can leave your muscles relaxed and tension-free. Added sniff bonus: It’s great for your digestive system and has natural anti-depressant qualities in its fragrance. Chamomile. You’ve probably heard about chamomile tea, but the aroma itself has fabulous drowse-inducing qualities. Sandalwood. Also known for relieving nervous tension, sandalwood will help your mind and body relax so you can score a date with the elusive Mr. Sandman. Sage. It’s not just a yummy stuffing ingredient! Sage has a calming effect and can soothe you to sleep. And they’ve been blaming the post Thanksgiving coma on the turkey all these years. For shame. Jasmine. Jasmine is found in perfumes, but also can lull you into a sweet slumber. Added sniff bonus: Jasmine also has an aphrodisiac quality to it. If you’re looking for a romp before a rest, try this scent first. There are different ways that you can use aromatherapy. Your chosen method is a matter of personal taste. Some women like to add a few drops of these oils to a relaxing bath, while others like a diffuser beside their bed. Other options include massage (I’m thinking jasmine…wink, wink), misting some in the air, sprinkling some on your pillow (you can get some specifically made for this so it won’t stain) or some eye masks even come with fragrance beads sewn right in. If you’re an on-the-go gal who could use some extra help getting to sleep, give some consideration to aromatherapy. There are a variety of scents that can aid you in grabbing the ‘zs you need tonight, so you can keep up with your daytime routine tomorrow. Get a whiff of some fragrant serenity and you’ll be getting your beauty rest in no time. ​What is a skincare serum? A skincare serum is a thick liquid-like, (generally) oil-free product with a high concentration of active ingredients and is often moisutrizing, although is not necessarily a moisturizer. They are often used after cleansing and before applying moisturizer or night cream as a sort of supplemental product. They’re commonly used in targeted skincare for anti-aging, anti-oxidation, hydration and plumping, brightening, evening skin tone and to help with acne. Some claims say that the molecules in serum are smaller than in lotion therefore they penetrate the epidermis (top layer of skin) more readily and quickly, but I haven’t found scientific evidence to back-up that claim. Generally speaking, cosmetics companies are free to use the term however they please (there’s no regulation) but this is the general lay person’s definition of a serum versus, say, a day cream or face balm. When do you use a serum? If you have a specific skin problem you would like to target or would like the benefits of a very light moisturizer coupled with, say, a brightening effect (which you would get from a Vitamin-C serum). They are not a necessary part of skincare but can be beneficial and effective if chosen with care (at 16 you probably don’t need an anti-aging serum) and used properly. If you’re seeking out high levels of specific ingredients in non-prescription skincare, you’ll be better off finding and using them in a serum than a regular face cream. For example, if you’re after pumpkin enzyme, probably get it in a serum or mask rather than buried halfway down the ingredient list in a lotion. Where do you use a serum? Serums can be applied to the entire face, neck and décolleté region. Because serums offer a concentrated, quick-to-absorb dose of ingredients that are often more potent or active than those found in moisturizers or creams because there’s less of the bulking out ingredients (water, propylene glycol, oil, etc.). You can apply it to a clean face by massaging in the recommended amount with clean finger tips. Key tip: Once you massage it in, if you have the time, let it fully absorb (five or so minutes) before applying your next product for maximum effectiveness.